Well clearly there’s not one answer, as it will depend on what and where you’re going to shoot and what type of person you are. I know some photographers who hate being weighed down by lots of gear and take only one body and a couple of zoom lenses out with them, or just one, if they can get away with it. They know that if they are weighed down with too much stuff it will stifle them and they won’t be able to function and get the shots they want. Whilst others will carry an absolute armoury of equipment, anything they need to get the shot at optimum quality. The purists will say that even with the best quality zooms, you are seriously compromising image quality. There’s no doubt, that there is a difference. I have a Canon 100mm macro prime lens and the sharpness of the images it produces are quite staggering. However my Canon EF 70-200 2.8 IS L series is also incredibly sharp. Not as sharp as the 100mm prime, but not far off. I think you can get a little obsessed about such things and get lost in the technology of it all, forgetting why we want to take pictures in the first place. In my opinion, it’s not to produce an image so that everyone can marvel at it’s technical achievement, but rather to create a striking image that has an emotional effect on the viewer and though it may sound a bit pretentious, changes their life in some small way. It is very easy in this digital age, to get bogged down and a bit obsessed by all the technical stuff. On the one hand this technology has simplified and opened the door of photography to many people who otherwise would not have got involved, which is great. The down side is a huge increase in image management workload and tons of extra gear, such as portable storage devices, batteries, memory cards, sensor cleaners etc. Then you have your computer, your screen and calibrat ion equipment, laptop, external hard drives, graphics tablets, DVD back ups and that’s before you’ve even come to your printer! Believe me, I am not naturally a technical person, ask my wife. I have had to force every bit of techno burble into my ill equipped and unwilling brain. I have in the past, felt so weighed down and overwhelmed by the amount of technology surrounding my work that I have wanted to scream. Well in actual fact, I have, on numerous occasions. I became a photographer to make images, not to become a computer expert. I think I’m a little bit sensitive about this subject at the moment, as the last two weeks have been all about sorting, editing and key wording a huge backlog of work from the last two months. Then you have the business of making copies in various formats, depending on their use. Some will be sent to libraries or microstocks all of which, rather helpfully, have different format and key wording requirements. Some will need editing for printing and others for websites. It all takes a huge amount of time and if you are not careful, you can spend more time in front of the computer, than out taking photographs. The whole digital workflow can be a real problem for people and is a definite down side to the digital revolution. I have met people who are almost at the point of despair with the whole subject. In fact, on my workshops, I now devote one section of the course to this very subject, going through, step by step each stage of digital workflow, from capture to print. Having had my little moan, I have to say that overall the digital age has brought huge benefits to many people, myself included, and I wouldn’t go back for the world. So returning to the original question. Normally I take most of my gear out with me at the moment. That’s to say, two bodies, my Canon 1Ds Mrk II and Canon 5D, with spare batteries for both. Then four Canon lenses; three L series, a 17-40 wide angle, a 28-70 medium zoom and a 70-200 telephoto. Then I have my 100mm macro. With these lenses I pretty much cover all eventualities. I will also take my Manfrotto tripod with its hydrostatic ball head, numerous neutral density and graduated neutral density Lee filters and various polarizing filters. My Canon 420EX speedlite, (my most under used bit of kit) as a little blip of fill in flash can sometimes prove useful, but generally I dislike the harsh unnatural light that a flash gives, even when it’s diffused or bounced. Then I have my cable release, head torch, small pocket torch, memory cards and various cleaning devices. All this is crammed into my Lowepro Vertex 300, a really brilliant bag, which has a laptop compartment and will still pass as hand luggage on a plane. Of course, if I were planning a photographic trip hiking up the Himalayas, I would certainly leave a few items behind. Landscape photography generally makes it difficult to travel light, I think. Firstly because you are often shooting in low light conditions, at dawn or dusk and often using small apertures, f11, f16, f22. These conditions generally make shooting hand-hel d impossible. When I start shooting pre-dawn I’m looking at 30 second plus exposures. Even if I can get the shutter speed down to a hand held level, I will often purposely slow it down with the use of filters or aperture, to accentuate movement in water or the sky, for example. So a tripod is a must. Then you have the huge range of subjects that you might be shooting, which necessitates carrying different lenses and I will quite often use all four of them in one session. 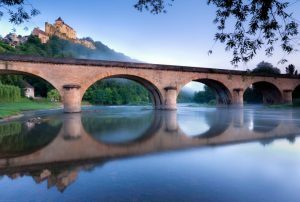 To give an example, the other morning I was out shooting the Chateau Castelnaud from the banks of the Dordogne River. The sky was a bit flat, but I was quite pleased with a couple of shots I got of the Chateau. I started of with my 17-40 wide-angle, which is my most used lens for landscape shots. I then went a bit tighter and switched to my 24-70 lens. What I often do, is have my 1Ds II locked on the tripod, normally with graduated filters or polarisers attached for my main shot. I will then have my 5D, with either my 24-70 or 70-200 lens attached, which I will use hand-held for other shots at the same location. I have two quick release plates, which are permanently attached to the two bodies, or the holding ring of the large 70-200. This saves time and a lot of fiddling about with the plate screws with cold fingers in the morning. It means if another shooting opportunity does arise on location, I don’t have to detach all the filters and cable releases from the Mrk II, change the camera settings, turn the mirror lock off in custom functions, which for anyone who has owned a Mrk II will know, is not as easy as it should be. Luckily it’s one of the few custom functions that I use so it tends to come up first on the list. In short, I probably wouldn’t bother if I had to go through that whole palaver every time. In any case by the time you’d done all of that, the opportunity of the shot you saw may have disappeared. You will also run the risk of missing the shot from your main camera as you are waiting for the optimum lighting conditions, at dawn or at dusk. This arrangement works really well for me and I have got many shots that I wouldn’t have done, if I had been using just one camera. So, after changing to my 28-70 lens on the tripod, I was shooting details with my 70-200 lens as the light was nice and warm. Later on after the light had become to strong, I drove to a second location in a partially shaded, wooded area close by. I switched back to the 17-40 lens for some wide-angle shots of poplar trees. I then spotted a colourful dragonfly that was still quite sleepy and trying to warm itself up in the early morning sun. So it was off with the wide angle and on with my macro lens, with the Mrk II attached to the tripod. I spent the next half an hour buggering about, chasing an increasingly active dragonfly all over a field. 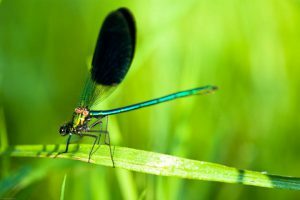 It was quite frustrating, as the depth of field is often so shallow on macro lenses, that the slightest movement, be it wind or the dragonfly itself, can make everything out of focus. No sooner had I managed to get the focus I wanted, off it would fly and I had to start all over again. Needless to say I was pretty wet by now from lying prostrate on the dewy morning grass. While all this was going on, I had been keeping one eye on a convoy of 4×4’s that had driven in at the other end of the field and were busy unloading three hot air balloons from their attached trailers. 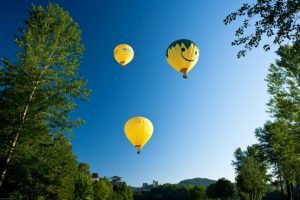 It’s a very popular activity for tourists in the summer season around here, as people get really magnificent views of the river Dordogne with all its Chateaux. This could be good. Oh bugger, where’s that dragonfly gone! I finally managed to fire off a couple of in focus shots of it, before it flew away for good. By this time the balloons were airborne. I left my Mrk II where it was and quickly grabbed my 5D changing the lens to my 28-70. I ran down the field toward the balloons, working out the depth of field necessary to get all three sharp and changing the settings on the camera, mid jog. I got the shot and some even had the Chateau of Beynac in the distance. All in all, a very successful shoot, made possible only by having most of my gear with me. The downside to all of this lens changing however is a lot of sensor cleaning. Finally as if the heavens had decided I’d had enough good fortune for the day, as I walked contentedly away from my final shot, I trod on a dead badger. I should say ‘in’ really, as it was very decayed and squashy under foot. I didn’t realise these things were so big and didn’t smell good. Needless to say, even after a detour to wash my boots in the Dordogne, they stayed outside the front door when I returned home!